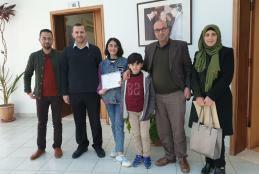 Hassib Al-Sabbagh IT Center for Excellence at the University honored Raghad Saed Maslamani in 11th grade at Tubas Girls Secondary School, for qualifying to the second stage on the Palestinian level at the competition in Palestine Science and Technology exhibition 2019, annually organized by the Ministry of Education. Raghad received third place in Tubas governorate her project " Window to Their Spectrum," which focuses on children with autism to find solutions to their behaviors. The project was hosted by Hassib Al Sabbagh Center. The Center congratulated Raghad and her family on this achievement, wishing them excellence and achieving good results during the second phase of the competition.